As adventures in the west continued to evolve beyond their text adventure roots, developers were looking towards new ways to let the player interact with their games. In the mid 1980's, developers began making adventure games controlled entirely with a mouse. These early mouse controlled adventures still had the verb and noun structure of text adventures, but actions were done by using the mouse to choose the words or icons on the screen. The earliest mouse controlled adventure game was the 1984 black and white Macintosh adventure, Enchanted Scepters, by Silicon Beach Software. 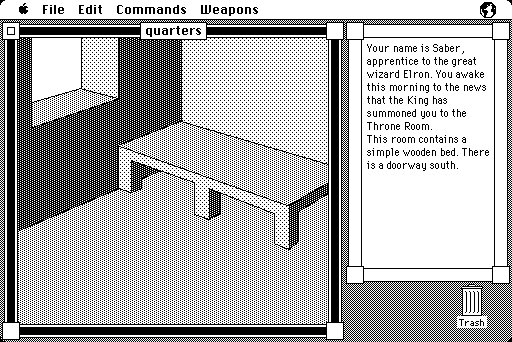 It was very much like the text adventures with static graphics. However, objects would be picked up by directly clicking on them on the screen. Like many keypad controlled graphic adventures of the time, actions were selected by a drop down list. However, the actions were selected from drop down lists from the Macintosh menu bar via mouse cursor rather than through drop down lists displayed on the game screen. 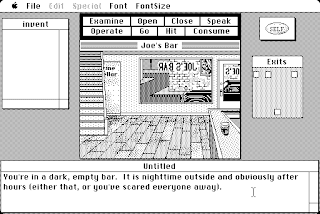 The first adventure game that displayed verbs on the game screen was the 1985 adventure, Déjà Vu, by ICOM Simulations. 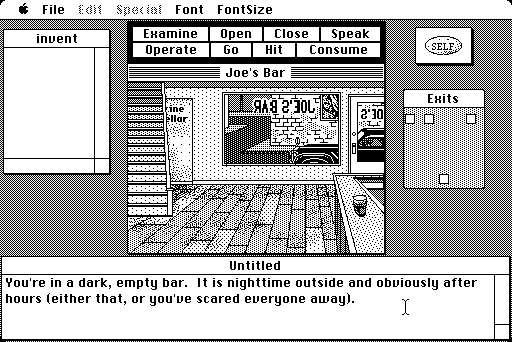 It still had the black and white graphics of the early Macintosh systems, and it still used the verb and noun system, but commands were no longer selected through the Macintosh system menu. The game was controlled completely in the game itself. The mouse cursor was used to select a verb from a list, which would then be used with an object which would also be selected with the mouse. The objects could be selected in the game display or inside of the inventory. This system of control would be later refined, but Déjà Vu paved the way for mouse control in adventure games, which is still the control method of most adventures today. Independently of ICOM, Lucasfilm Games was also developing a mouse controlled adventure. Released in 1987, Maniac Mansion introduced SCUMM (Script Creation Utility for Maniac Mansion), which has been popularized by the fan created virtual machine, ScummVM. 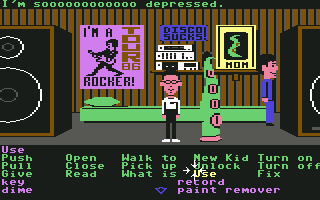 Most importantly, Maniac Mansion displayed its verb and inventory bars within the game screen itself. Maniac Mansion also stuck to its text adventure roots, by displaying the verb and noun selection in text above the verb bar. This would set the standard which was used by most adventure games until the late 1990's, and is still used in some adventure games to this day. All of the 2D adventures by LucasArts from this point would use a variant of this engine. 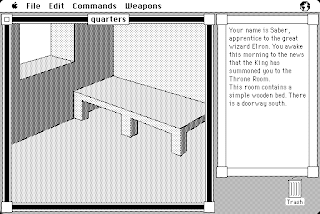 As the mouse was gaining popularity, Sierra began to include optional mouse support in their adventure games. 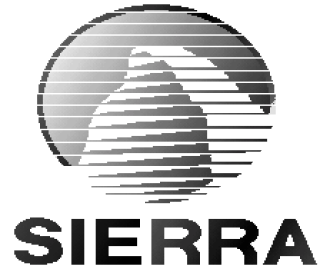 Sierra began porting adventure games created with their AGI (Adventure Game Interpreter) engine to the Amiga in 1986. The Amiga version of this engine allowed for optional mouse control of the player character. This functionality has been extended by some fan created AGI interpreters, such as NAGI and ScummVM. The fan interpreters allow mouse control of characters in most AGI games, as in Sierra's Amiga AGI interpreter, even those that did not originally include that function. When Sierra switched to the more capable SCI (Sierra's Creative Interpreter) engine in 1988, the optional ability to control the playable character with a mouse was present on all platforms. The text parser was originally hidden from view until the player began typing, but as time went on, the SCI engine was improved, the text parser was removed, and games were controlled completely by mouse. All of the 2D adventures by Sierra from the time SCI was introduced used a variant of that engine. Mouse controlled adventure games would become the standard after the release of these games, and continue to be the standard to this day. The adventure games that followed these evolved the presentation, but the method of input has largely stayed the same. Even today's direct controlled adventure games often have optional mouse controls as well, or a combination of mouse and keyboard controls.